If you are updating your kitchen and looking for a statement piece, consider adding an farmhouse sink (also known as an apron sink). In the last few years, farm sinks have become popular in kitchen remodels. Not only are they extremely functional, but they also serve as a focus piece. Coming in multiple colors, there’s an option for every kitchen. In the 1800s and 1900s, farmhouse sinks were found in many rural homes where women spent their days cooking and cleaning for their large families. These sinks were incredibly fitting for their needs. The design of the deep basin made it easy to wash large pots and pans and perform other duties on the farm. In the mid-1900s people moved to the smaller and divided kitchen sinks. Now, the apron front sink is making a come-back in modern kitchens. Ergonomically, the farmhouse sink is superior to traditional drop-in sinks. By bringing your body closer to the basin, you don’t have to bend over as much to reach the dishes. This design prevents aching backs and is noticeably more comfortable for all who use it. 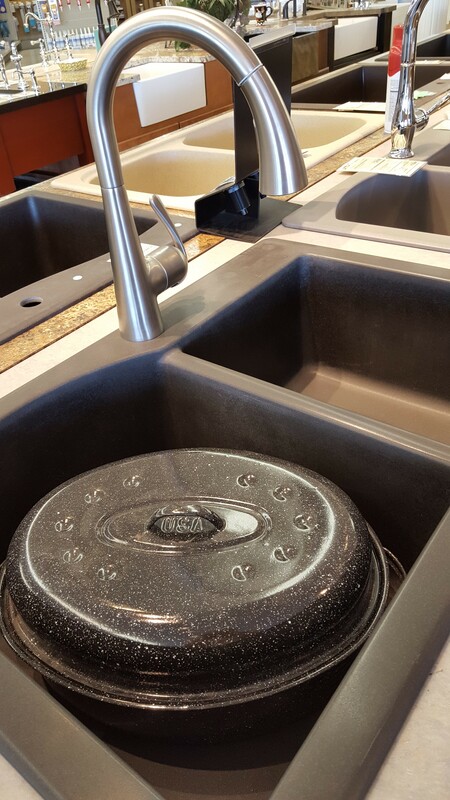 One of the greatest benefits to an apron front sink is the ease of washing large pans. Most people have a dishwasher in their kitchen, so they do not have many dishes to do on a daily basis. The single large basin works well for them because the only things they hand-wash are large pots and pans. These pans fit extremely well in the large sink and will be clean in no time! Along with the benefits of easy cleaning, back relief and style, the apron sink will last you a lifetime! Consider the elements of a timeless design in your kitchen remodel and pick up the perfect piece for your home at Handy Man! 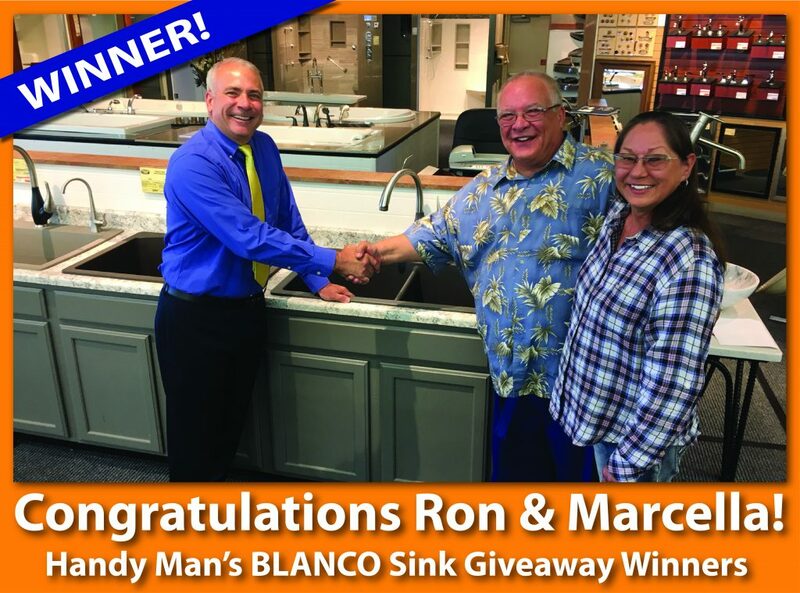 Congratulations to Ron and Marcella on winning our Blanco Kitchen set! 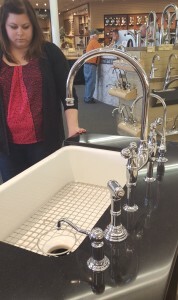 They met with Handy Man President, Joe Swenson, and took home a matching sink and faucet worth over $900! Congratulations again and thanks for entering our giveaway! 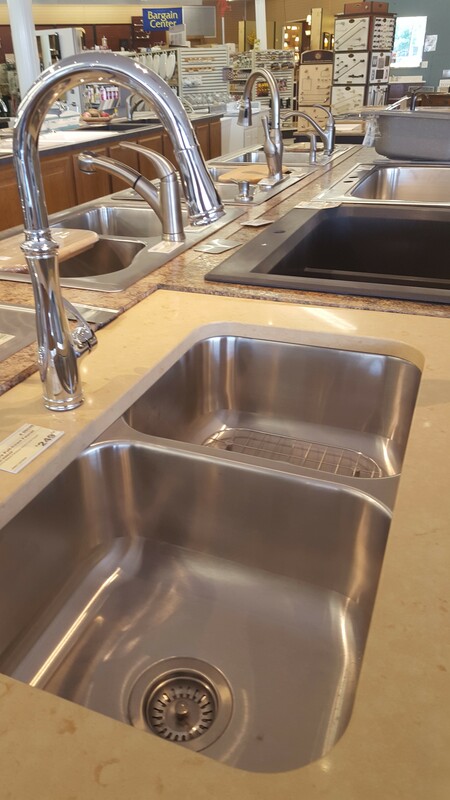 We recently sat down with Siouxland Woman Magazine and answered a few of the commonly asked questions about kitchen sinks. Read below for answers to these questions and more! I had never thought much about kitchen sinks before. I never had a reason to. Things change when you begin a kitchen remodel, however. I had a lot to learn about sinks and thankfully Handy Man had the right information for me. So Handy Man, are there some things to consider when buying a kitchen sink or are they pretty much the same? There are some very important things to consider when replacing your kitchen sink. Believe it or not, there is a sink for every person depending on your lifestyle. 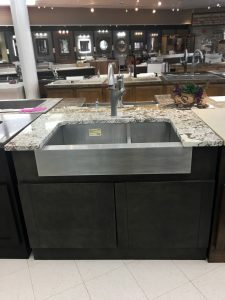 Ok, so what should I consider when looking for the perfect sink for my kitchen? One of the first things you should do when looking for a sink is to check the bottom of the sink. Is there a flat surface area on the sink bottom? Sinks with more flat space can be more expensive, but they are a better product because of design. You’ll be able to place more dishes in the sink on a flat surface without them tipping over, making it much safer for your glassware. I hadn’t thought of that and of course that makes sense. What about drain location? Drain location should be near the back of the sink. 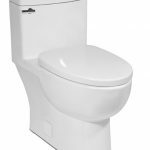 When the drain is located near the back, the disposal and trap are also towards the back providing you with more space under your sink for storage and for your garbage receptacle. What about noise? Is this something I should consider? Yes. Less expensive sinks have less sound proofing. 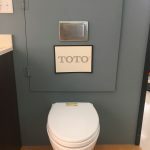 When you run your disposal it will be very loud. Pay attention to the thickness of the steel. The smaller the gauge number, the thicker the steel. Heavier steel won’t dent as easily and will be much quieter. 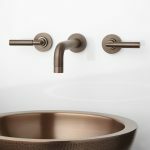 What about undermount vs. drop in sinks? It’s much easier to sweep crumbs into your sink from your countertop with an undermount sink and they give you more depth. I really like the look of stainless steel. Is there a difference? Of course. 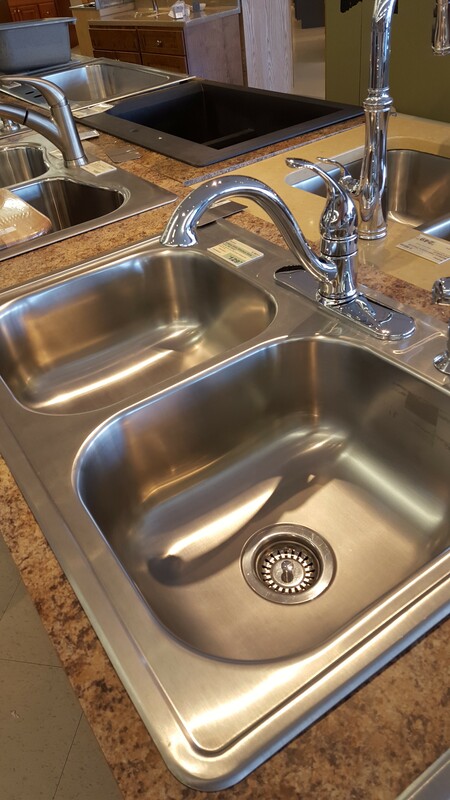 Better quality steel sinks are given hand polished highlights at the factory using a buffing wheel, so you’ll want to look for a sink with a nice shine. 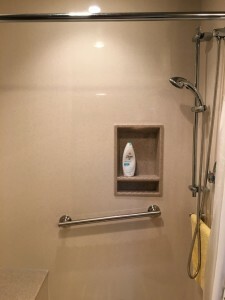 It will be more visually appealing and it will be easier to clean. Are there other materials I should consider? Yes, there are other sink materials. Some sinks are made of a stone-like material often called ‘quartz’ and are very durable. They’re made to be the most sanitary, hard to scratch and come in several color options. I’m trying to decide between one bowl or two. What do you suggest? 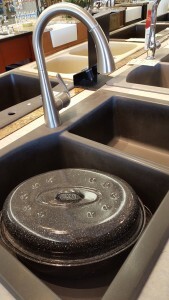 One bowl sinks are becoming more popular but two bowls are standard. It depends on which you prefer and the types of things you are washing. Along with that you consider the divides. A lower divide works best for soaking frying pans, but you can still fill the entire sink up with water if needed. Is there a standard size for sinks? Standard kitchen sinks are 33×22. Most of the sinks in your home could be replaced by another standard size that will fill the same space while providing a new look. What is trending currently in kitchen sinks? 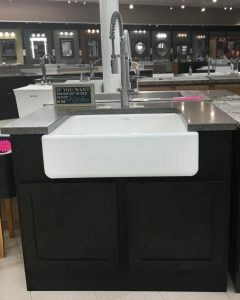 Apron front farm sinks are becoming more and more popular. You don’t have to lean over and reach as much, putting less stress on your back and they are beautiful! The most important thing is to make sure you decide what works for you and your family. What works well for one person may not work for another. And, by all means, make sure to look at the sinks in person, stand in front of them, and reach your hands inside as if you were doing dishes. That is the best way to make sure it will work for you. Check the flat surface area on the bottom of the sink. Sinks with more flat space can be more expensive, but they are a much better product because of the design. You’ll be able to set more dishes on a level surface without them tipping over, such as glassware. Drain location. The drain should be near the back of the sink. When it’s near the back, the disposal and trap are also positioned back in the cabinet below, leaving you much more room under the sink for a garbage receptacle or storage space. Is your sink noisy? Less expensive sinks have less soundproofing. When you run your garbage disposal, it will be very loud. Note the thickness of the steel. The smaller the gauge number, the thicker the steel. Heavier steel won’t dent as easily and will be much quieter. Under mount vs. drop-in sinks. Under-mount sinks are easier to sweep crumbs from your countertop into the sink and will give you more depth. Stainless steel sink finishes. Better quality steel sinks are given hand polished highlights at the factory using a buffing wheel. Look for a sink with a nice shine. It will have more eye appeal and it’s easier to clean. Sink material. 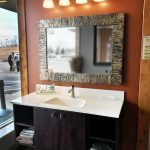 Some sinks are made of a stone-like material often called ‘quartz’ and are very durable. They’re made to be the most sanitary, hard to scratch and come in several color options. One bowl vs. two bowls. One bowl sinks are becoming more popular, however, two bowls are standard. It depends on which you prefer and the types of things you’re washing. Low divide vs. high divide. A lower divide works best for soaking frying pans, but you can still fill the entire sink up with water if you need to. Sink size. 33×22 inch sinks are the standard size. Most of the sinks in your home could be replaced by another standard size that will fill the same space but will give you a new look. Apron front farm sinks. These sinks are becoming more and more popular. You don’t have to lean over and reach as much, putting much less stress on your back. No matter what you decide for your kitchen sink, make sure it’s a sink that works for you and your family. What works well for one person might not work for another. Be sure to look at sinks in person if possible, stand in front of them, reach your hands inside as if you were doing the dishes and see how it feels. 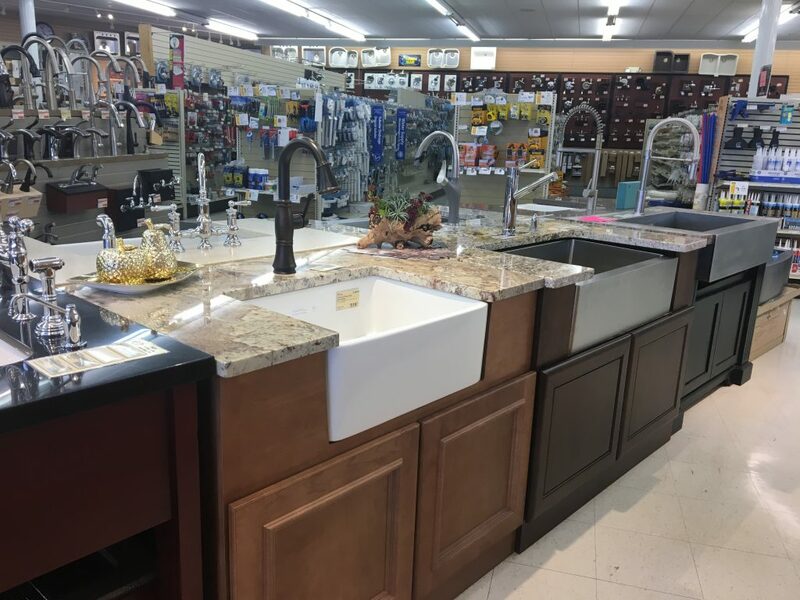 At Handy Man, we display our kitchen sinks at floor level so you can experience a variety of kitchen sinks and find the perfect one for you! Check the flat surface area on the bottom of the sink. Sinks with more flat space can be more expensive, but they are a much better product because of the design. You’ll be able to set more dishes on a level surface without them tipping over, such as glass ware. Is your sink noisy? Less expensive sinks have less sound proofing. When you run your garbage disposal, it will be very loud. Note the thickness of the steel. The smaller the gauge number, the thicker the steel. Heavier steel won’t dent as easily and will be much quieter. Under mount vs. drop in sinks. 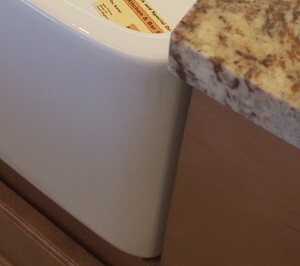 Under mount sinks are easier to sweep crumbs from your countertop into the sink and will give you more depth. Sink size. 33×22 inch sinks are the standard size. 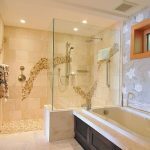 Most of the sinks in your home could be replaced by another standard size that will fill the same space, but will give you a new look. 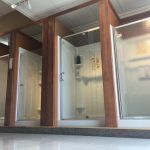 Handy Man is the Kitchen and Bath Expert for Sioux Falls’s Hood Magazine. Check out our article in the “Home” section of every issue of Hood Magazine. How to shop for your kitchen sink. If you’re installing new cabinets, countertops, and everything that goes along with a kitchen remodel, don’t make your kitchen sink an afterthought. A kitchen sink can be the focal point of this room—the bowtie, really. 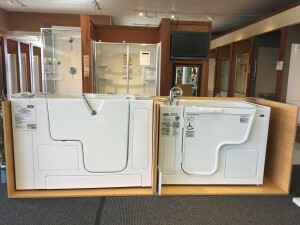 It can have both functional and style qualities that will make your time rinsing food, washing dishes, or doing any number of tasks that much more enjoyable. 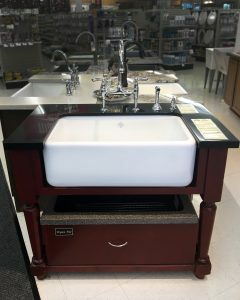 If you’re shopping for a new kitchen sink, we have some considerations you should keep top-of-mind during your search. The majority of kitchen sinks are drop-in, meaning you put them into the countertop opening with an exposed rim that goes around it. However, a recent trend is to install an undermount sink. 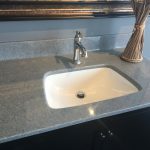 This type of sink is typically seen with solid surface or granite countertops as the counter edge is exposed with the sink sitting just beneath the surface—making for easy clean-up. Simply wipe crumbs straight into the sink. 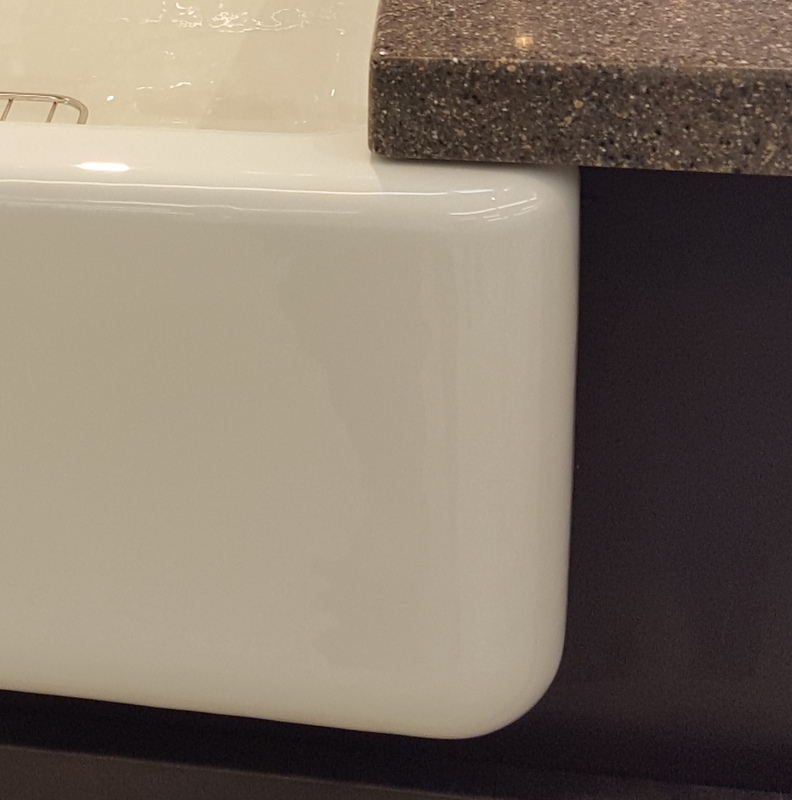 If your countertop won’t allow you to install an undermount sink, some manufacturers are also making drop-in sinks with a lower rim. Depending on how much you use the kitchen sink and your decor theme, you’ll want to consider a range of materials. Stainless steel is widely used and can range from inexpensive to moderately expensive. The thicker the steel, the better the quality (and noise reduction!). You don’t want to turn on your garbage disposal and have the entire house shake. Composite sinks by brands like Franke, Swanstone, or Blanco provide many choices as far as shape, color, and pattern. 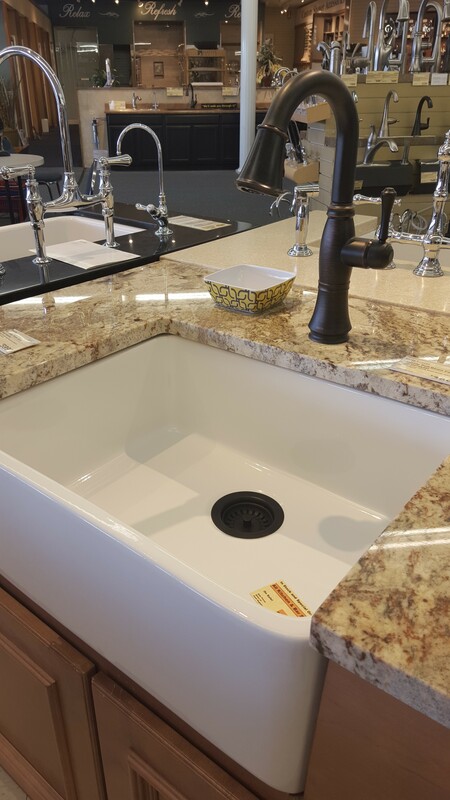 Composite sinks are made out of a blend of materials such as resin, acrylic, and natural stone, but are extremely durable, easy to clean, and scratch resistant. They also hide water spots well. Enameled iron is a great option for homeowners looking for an old farmhouse sink style. 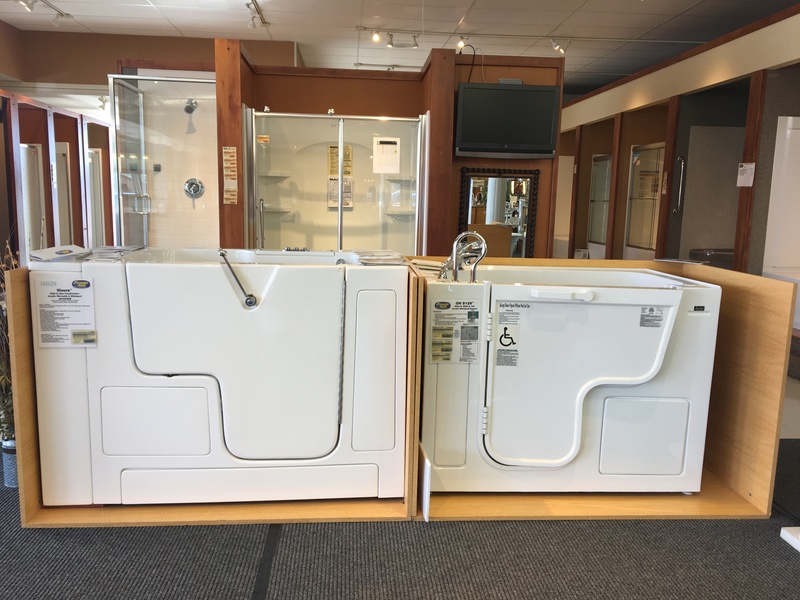 These types of sinks can last a lifetime and are heavy-duty. This glossy finish is non-porous and easy to wipe down. Just don’t use abrasive cleaners. 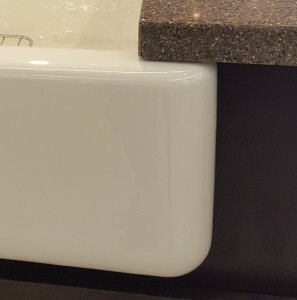 Fireclay sinks, like the Shaws Original by Rohl (pictured above) also have the same smooth-as-glass finish. This is another durable option for a contemporary or country style home. Like enameled iron sinks, it’s non-porous and cleans with ease. You can keep it looking its best by adding a protective sink grid (like the one in this photo) to prevent scratches from abrasive surfaces, such as cast iron pots and pans. Stone (yes, solid rock) is also an option for your kitchen sink. Stone sinks are typically carved out of a single piece of rock, giving your kitchen a unique look. Because it is stone, it’s very heavy—weighing around 300 pounds. 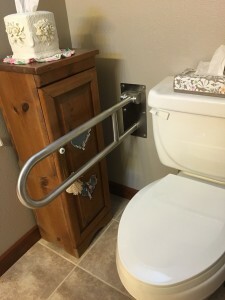 Because of this, you’ll need to build extra support to hold it in place. The “sculpture like” qualities of this sink will make it the centerpiece of your kitchen. 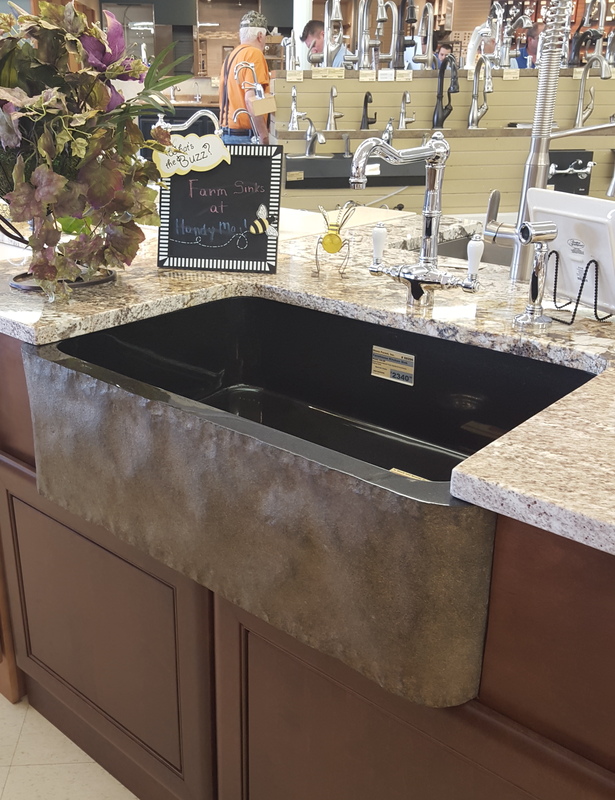 Apron-front sinks, also called farmhouse sinks, slide right into your counter leaving an exposed front panel. The sink apron is mounted flush to the cabinet allowing you to stand close to the sink. This makes it much easier on your back when you work at the sink for an extended period of time. 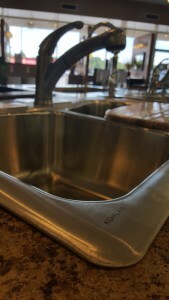 Kohler manufactures apron-front sinks with a unique feature added—a lip on the front sides of the apron that will cover the gap between the cabinet and the sink. This can come in handy as the cut made into the cabinet doesn’t have to be as perfect. Flat bottom sinks, opposed to sinks with curved bottoms, can hold more dishes with ease. Also, dishes, such as wine glasses, can rest flat on the bottom of the sink, allowing more room to stack without fear of glasses tipping over and breaking. 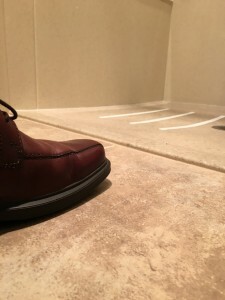 Drain placement is also something to consider. New kitchen sinks will oftentimes put the drain near the back of the bowl. If your sink is piled with dishes, this will allow you to access the drain more easily as well as give you more usable space in the cabinet below for a waste basket. Think about the number of bowls you’ll need. 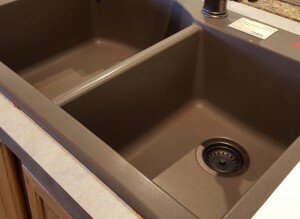 Some kitchen sinks have a low divider that sits below the top level of the sink so bulky items can remain in the sink, yet you can keep clean and dirty dishes separate. You can opt for a sink with a single bowl or a double bowl where each bowl is separate. 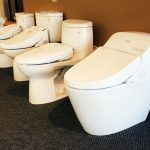 You can also opt for unique bowl sizes and shapes to fit large items. Finally, you need to know the placement and number of faucet holes you need before installation. You can have one or many, making one for the faucet, soap dispenser, filtered water, or sprayer. (At Handy Man, we can drill as many faucet holes as you wish—free of charge—if you purchase a kitchen sink from us). Also, because you’re reading this, we wanted to let you know we’ll be having a sale on faucets this July. More information to come! 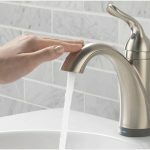 Have questions about kitchen sinks? At Handy Man, we can help you choose a sink for your unique needs and taste. You have more options than you may think. Stop by our showroom any time to chat with an expert about kitchen sinks. 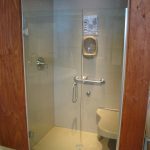 After all, kitchen and bathroom remodeling is our specialty. It’s like we always say — we’ll walk you through it.